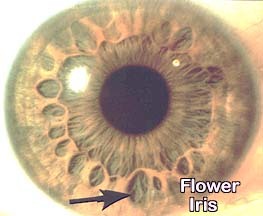 The structure of the Iris is determined by the arrangement of the white fibers radiating from the center of the iris (or pupil). In this image you can notice they are uniform and reasonably direct or parallel. All irises contain these fibers although in some irises (typically very dark irises) they can be a challenge to discern (in truth - in very dark irises we find it a challenge to discern anything ! 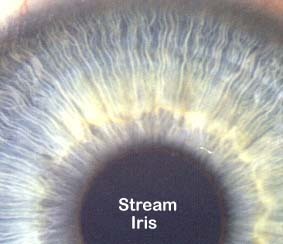 The regular arrangement of these fibers is the key to the Stream Iris structure. This image illustrates the stream iris fiber arrangement. This is the most challenging of the four iris types to identify and we encourage you to look at the other Flower, Jewel and Shaker structures. You can also go directly to the Stream interpretation. In a Flower Iris the fibers radiating from the center are distorted (in one or more places) to produce the effect of petals (hence the name Flower).  In this image you can notice they are neither regular or uniform. A flower iris may have only one significant petal with the remainder of the iris looking like a stream. The irregular arrangement of these fibers is the key to the Flower Iris structure. This image illustrates the flower iris fiber arrangement. The fibers form rounded openings in the iris - these vary in size, density and intensity and are likely to be more apparent in the left eye.. This is usually much easier to identify than a stream iris - but remember if an iris is 90% stream and 10% flower it is best interpreted as a flower at this stage. or you can have a look at the other structures Stream, Jewel and Shaker descriptions. The Shaker Iris is identified by the presence of both flower-like petals in the fiber arrangement and pigmented dots or jewels. The presence of even one jewel in an otherwise Flower iris is sufficient to cause the occupant to exhibit Shaker characteristics. The distribution and density of flowers and jewels can vary substantially between the two eyes. 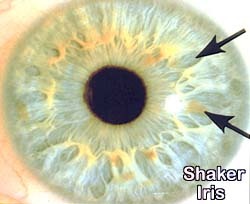 The presence of both Flower and Jewel characteristics is the key to the Shaker Iris structure. This image illustrates the Shaker iris fiber arrangement. The fibers form rounded openings in the iris -just as in the flower iris. The fibers are overlaid by pigmented dots or jewels as in the jewel iris. You can view more shaker irises, move to the Shaker interpretation or look at the Stream, Flower and Jewel structure descriptions. Stream irises indicate a kinesthetic individual - a key phrase is "in touch" since these individuals tend to interpret life's experiences through their physical being or their physical senses. 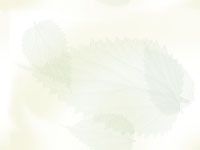 Streams tend to be intuitive, grounded and stable people - they communcate through touch (often feeling more comfortable communicating once a physical (touch) connection is established). Streams will find it easier to understand what you mean if you put a hand on their arm or shoulder. A remarkable sense of connectedness produces talents in mediation (streams are 'in touch' with both sides of a difference). 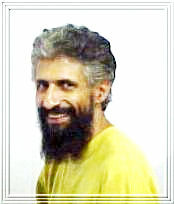 Their stability and groundedness are also real assets in resolving disputes. Streams are blessed with accurate intuition and usually know that when they follow their feelings all goes well but when their emotions or mind occupies the driver's seat - all does not go well. Flower irises indicate an emotional personality. Flowers are social individuals who are exciting (for others) to be around. Highly reactive and changeable - flowers are passionate, enthusiastic and generally fun to be with. Flowers express themselves visually - their appearance is of paramount concern and they communicate with large, open gestures and emotions. Conversely they take things in through their ears - learning best by listening. Many flowers find reading books a difficult means of study until they read aloud - thus activating their 'primary intake mode'. Flowers are emotionally reactive - easily becoming angry and blaming someone else - many flowers might be near to speechless if they were deprived of the word "you" ! The main challenge for the flower personality is self-control, learning to trust themselves and to accept responsibility for their lives and actions. Should a flower start to blame themselves then depression and despair follow swiftly. Highly averse to being controlled flowers also fear abandonment or separation. 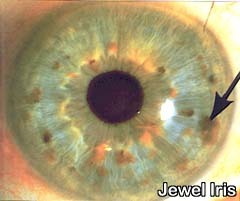 Jewels in the iris are indicative of a mental type. They are typically analytical thinkers expressing themselves through speech. Slow to acknowledge feelings, jewels prefer to rely on accumulating and classifying data to arrive at the 'correct' decision. For a jewel, "I think therefore I am" is better put as "I am therefore I think". To an outsider, they may appear indecisive - it is more accurate to say that they are still waiting for the final data to present itself before committing themselves. Once they do, however - there is rarely any reversal without upheaval - to a jewel, changing a decision is akin to destroying their belief structure ! Shakers combine the extremes of flower and jewel characteristics to produce the fourth personality type - the extremist. Highly motivated, radical, dynamic individuals, they exhibit great persistence and are continually chasing a better way of doing things. Possibly the most challenging type to be around, shakers represent society's conscience - trifle with their ideals at your own risk ! Pioneers and innovators they are rarely content with the status quo - for more that 5 minutes at a time anyway ! Motion oriented - shakers may appear impatient and are often dissatisfied with waiting for others. People are often attracted by their energy and zest, however they are challenging to keep up with and find it challenging to stay with a project once it's underway and has lost it's 'new' feel. Shakers are sensitive to being controlled or organised - they are usually keenly aware of a better way of doing things - their experiences as employees are typically difficult and testing for both themselves and their supervisors. The great challenge for most shakers is stillness - the ability to sit and simply 'be' - and yet, if this ability is not developed, they are prone to self-destruct through exhaustion and neglecting their bodily requirements (rest, nutrition, exercise etc).